For over 30 years, Cat’s Cradle Needlepoint has been creating unique specialty needlepoint designs. Our canvases are all stitch painted on top quality Zweigart canvas, with new designs being added all the time. Sign-up for our mailing list to receive new design notifications, or click on the link below for wholesale login and password. For a list of shops and stores that carry Cat’s Cradle Needlepoint designs, click here. 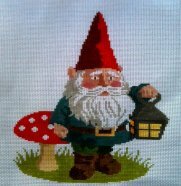 Our cute Garden Gnome can be found in the Miscellaneous section of the Needlepoint Catalog. 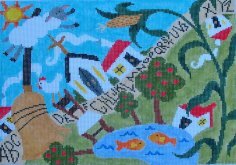 This whimsical Village Sampler is found in the Sampler section of the Needlepoint Catalog. The inspiration was the historic Sauder Village in Ohio.